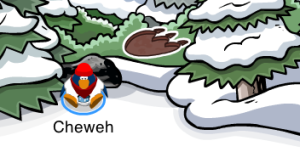 Click on the Club Penguin Map and then click on the trees located between the Plaza and Cove. The Dino Footprint Pin is located between the trees at the Forest. Club Penguin has also updated the Snow Forts, adding the Time Trekker, which I believe has something to do with the upcoming Prehistoric Party on January 17. Furthermore, a new Furniture Catalog for January 2013 was also released, sporting some new furniture for your Igloo during the Prehistoric Party. What do you think of the new Dino Footprint Pin and the new Furniture Catalog? I personally think that the new furniture available is a bit dull, but I am not complaining. If you need some coins to purchase the new furniture on Club Penguin, be sure to try out our Money Maker! This entry was posted in Pins on January 11, 2013 by admin.